This is a full campaign AAR of the War in the East wargame by Gary Grisby played from the German side against AI. 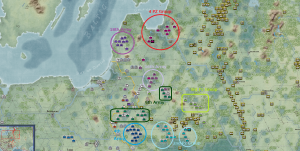 The objective is not only to examine the wargame and report on the game mechanics but also to discuss the war progress via visual maps of the campaign. In the following map, we show the situation after two turns, on 3rd July 1941. This is the North and Center Army Groups screenshot. The Soviet forces are preparing a solid defensive line hundreds kilometers behind the front line. AAR War in the East. Barbarrosa snapshot view after 2 turns: 3rd July 1941. The situation requires a prompt and appropriate decision for the Germans. Should they move 4 Pz Group directly to clash against the soviet forces protecting Leningrad? The Army group center has succeeded encircling a large number of Soviet divisions, using the 2nd and 3rd Panzer Groups. What should be the directions of the 4th, 16th and 9th Armies? This is frankly a complex game, however, you can realize after playing a few turns it is not difficult to move all units in reasonable time and have a clear global view of the campaign by plotting the type of maps I’m showing in this post. We are open to heard your comments, and continue playing with your suggestions!